Rebecca Peterson and Renisha Gibbs offer expert advice to HR professionals from around the country. Florida State University’s human resources leaders are teaching innovative, valuable lessons to HR administrators across the United States. Four members of FSU’s HR team offered expert advice at the annual conference of the College and University Professional Association for Human Resources (CUPA-HR) in Washington, D.C. last month. CUPA represents more than 20,000 human resources professionals at nearly 2,000 organizations nationwide. Gibbs and Rebecca Peterson, assistant director for Faculty Relations, presented a session called “Transformational Faculty Salary Increases: Balancing Equity with Performance.” It focused on the challenges of retaining the best faculty members as salaries escalate around the country, while also offering competitive pay for new faculty. FSU employs about 2,100 faculty members. Gibbs and Peterson conducted a case study, examining the market value for Florida State’s faculty members and their recent pay increases. In 2015, the university paid out $2 million in market equity raises for tenured and tenured-track faculty members. Nearly 600 faculty members received the pay increases, capped at $10,000, in September. One year later, the university paid another $1 million for market equity raises to in-unit faculty members, including specialized faculty members in teaching, research and librarian tracks. Gibbs and Peterson encouraged HR managers to work with administrative leaders to resolve those issues, make sure a compensation strategy aligns with a university’s strategic goals and secure buy-in from unions. 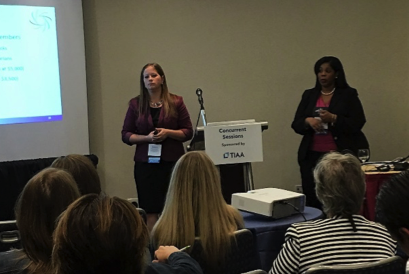 Two other leaders of Florida State’s human resources team hosted a separate session at the conference, offering practical guidance on how to modernize business practices and turn paper-heavy practices into electronic processes. 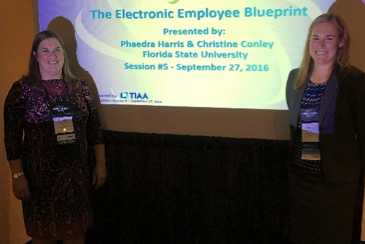 Phaedra Harris, director of HR Operations, and Christine Conley, associate director of the Office of Human Resources, presented “The Electronic Employee Blueprint.” They hope the lessons will be shared with CUPA’s members nationwide. More than 1,000 human resources managers from universities and colleges around the country attended the conference. The College and University Professional Association for Human Resources serves higher education by providing the knowledge, resources, advocacy and connections to achieve organizational and workforce excellence.